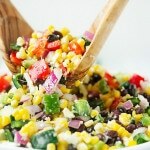 Debbie first made this corn salad when we went camping for the September long weekend a few weeks ago. It was a big hit and since then we have made it again with similar results. It was just so good that we had to make it again right away before the good fresh corn was finished for the year. Seriously, when we were camping, I kept going into Debbies fridge and getting fork fulls or little bowl fulls all weekend long. 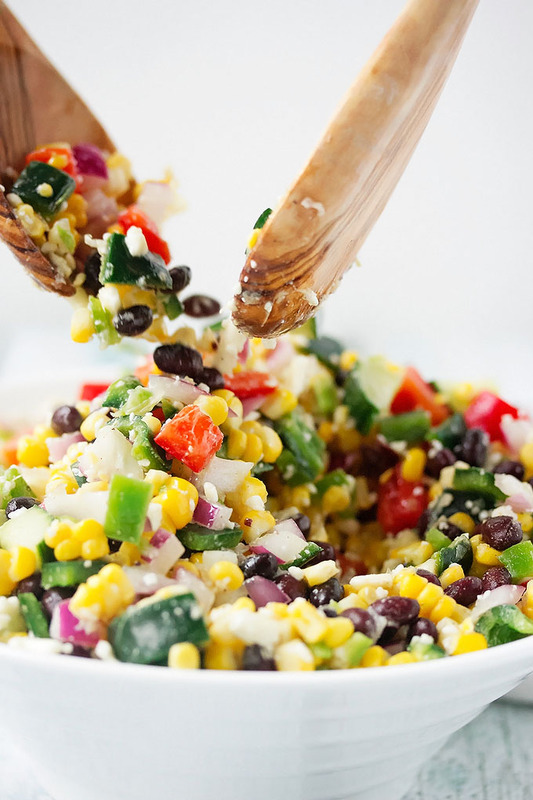 It is super fresh and healthy, chock full of veggies and beans, with a simple dressing that you can easily whip together. Kevin and I recently had a bunch of our family over for a final dinner in our house. Debbie and Mark couldn’t make it but Debbie had been over earlier cooking with me for the blog. We made this salad to take some photographs of for the blog and also so I could serve it for dinner with the burgers I was making. Everyone who came for dinner had something good to say about it although I’m not all that surprised. Its pretty awesome! 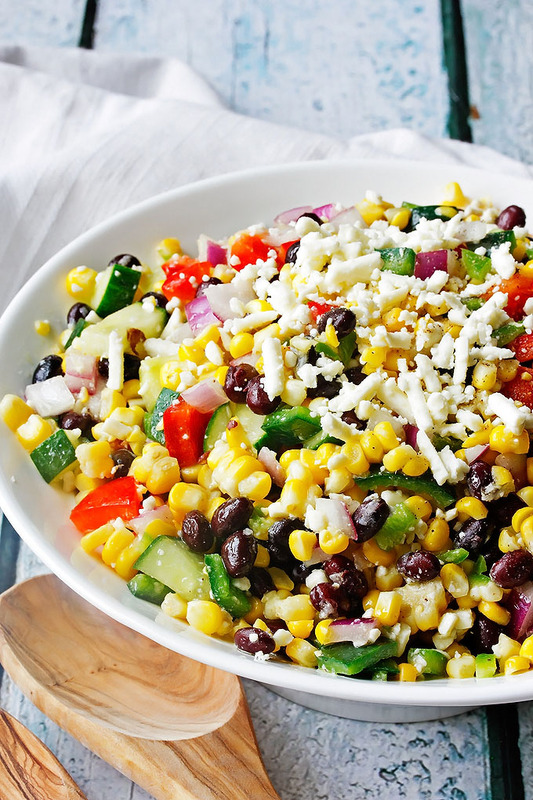 We made ours with fresh corn because we can still get delicious Chilliwack corn, but you could easily make this salad with canned corn as well. I just wouldn’t use frozen corn, it won’t have the same kind of taste and texture. 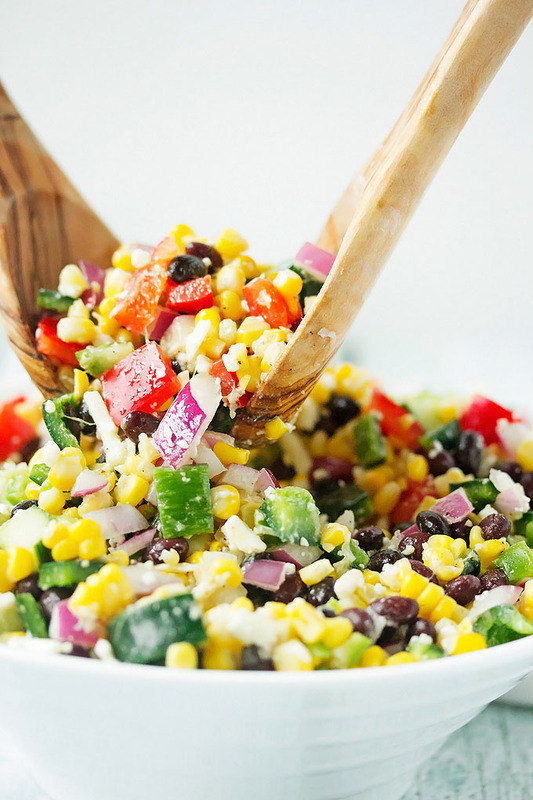 Last summer we posted another corn salad that is admittedly similar, however I like this one quite a bit more. This one has 3 different kinds of peppers with different levels of heat. 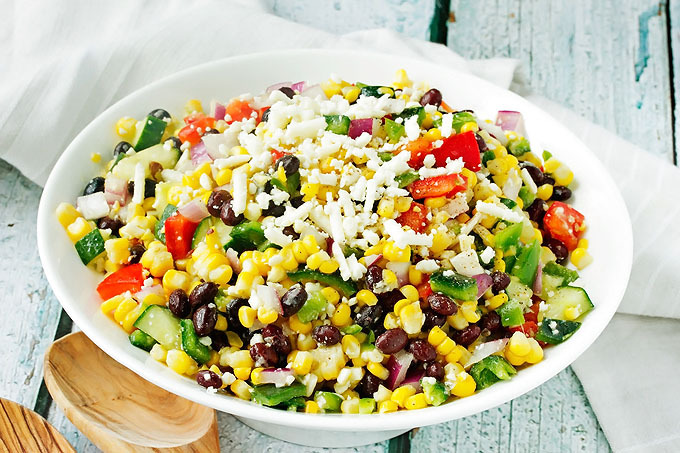 I like the little bit of heat in this salad mixed with the black beans and sweet corn. It has a bit of a tex-mex type of flavor without going all the way. The first time Debbie made this salad, she used our ranch seasoning and it was amazing. The second time we made it, we didn’t have the ranch so we used the seasonings listed in our recipe below which still tasted great, but in my opinion, the ranch seasoning is just a tad bit better. We just wanted to tell you about both options and list the alternative in the recipe as not everyone will have a batch of our ranch seasoning mixed up, although its easy enough to make and you really should try it… just saying. Or , if you have some 1 tbsp of our ranch seasoning works really well in this. Cook the corn in a pot full of boiling water. Once it has cooked, remove it from the pot and let it cool. Cut the corn off the cob and place in a large bowl. Dice the onion and Anaheim pepper and add them to the bowl. Chop the poblano peppers, red pepper, and cucumber. Add them as well. Rinse the black beans well and add them. Measure out the feta and put it in the bowl. In a smaller bowl add the vinegar, olive oil, lemon juice and ranch seasoning. Mix it up well and pour over the ingredients in the large bowl. Mix it well and serve!